A sneak peak at the finished product. The last two were purchased because I couldn’t remember the name of the spice required. I knew it started with the letter “C”, yet that was all. I was wrong, I needed Corriander. Anyway, once I was home and checked my recipe I realised I had made a mistake with my selection of spices. I decided to go ahead with the recipe anyway, and use a little Cyanine Pepper to flavour the meat. I sliced the meat into long strips around 3 cm in thickness. I removed any excess fat from the meat, yet I could not remove all of it, which was not a serious issue. Jack Spirko says that the fat tastes like Candle Wax when the meat is dried in the Biltong method… yet as I could not remove it I decided I would put this to the taste test. I dipped the strips into a ceramic tray into which I poured some Apple Cider vinegar. I made sure all sides of the meat were covered with this solution before I placed them into another tray, where I added Sea Salt, freshly ground Pepper and A light sprinkle of Cyanine Pepper. These were then placed into a tray and transferred to my fridge for 24 hours. The next day I removed the meat from the tray, which had already partially filled with the fluid contents of the meat. I skewered each piece of meat, thinnest part first with the fattest part hanging lower, on a chopstick (I couldn’t find any kebab skewers). I placed these in a storage area in my house, which would ensure no insects got to the meat and it was out of the way. Regardless, Kitty immediately complained about the smell. She said that it smelt like rotten meat. I could only smell the aroma of Vinegar and Pepper, which I found to be a pleasant smell. I suspected that Kitty, who has not eaten dried meat and appeared very apprehensive about the process, imagined that she smelt rotten meat. Anyway, I decided to move them so that it would not bother Kitty. 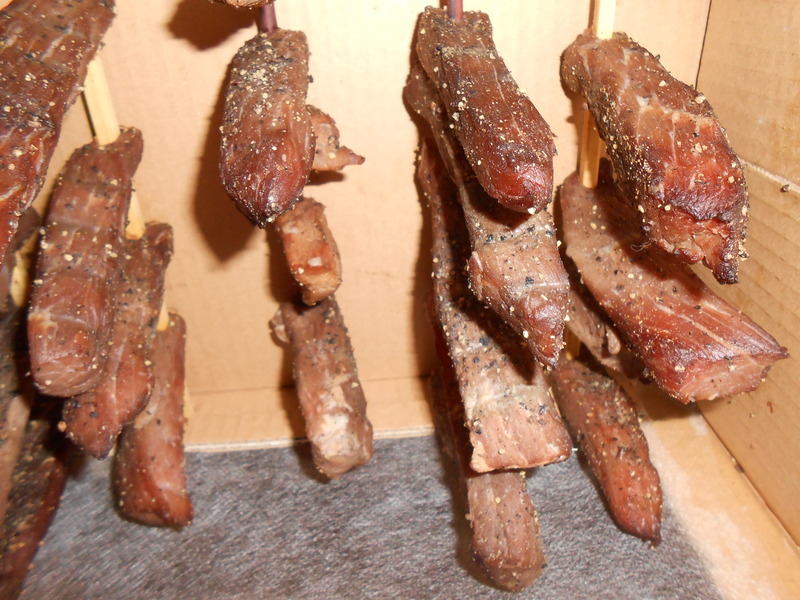 Meat hanging from my Biltong Drier. Moving the meat now presented a new problem… where would I place it? I decided that I would need to construct a housing for the meat and place the box outside to dry in the air… which should actually produce a better end product. I considered building something out of scrap wood (as I usually do), or perhaps repurposing something I had already built, yet in the end I decided on something a little different. 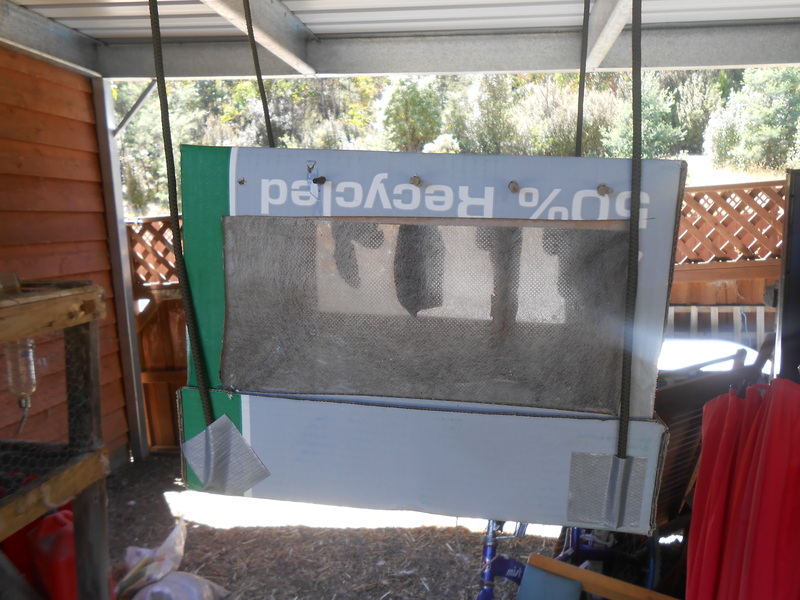 A cardboard Biltong Drier. My craft skills are very high. I had an empty box which had previously held A4 paper, which I had intended to use for packing some items in preparation for our eventual move. This box was the right width to hold the chopsticks I had used to hold the drying Biltong. I cut two large windows into the front of the box to allow air flow, and (using aquadhere glue) I attached a rectangular sheet of frost cloth to act as a fly screen. My reasoning was that this material allowed air, yet was fine enough to stop nearly all insects… and I have several rolls of the stuff. In addition, aquadhere glue is non-toxic… so it shouldn’t secrete and residue that would be harmful. I used a few cut lengths of Paracord along with some Occy straps to suspend the box from the roof of my car port, this was done to keep the box from any animals (such as my dogs) who were curious about the contents. Over the course of the weekend I tried a piece or two a day and each day the Biltong improved in flavour and texture. I am also happy to say that I did not find the fat to taste like candles. This cold be due to the herbs I used, the time spent drying, or maybe I just have different taste than Jack Spirko. 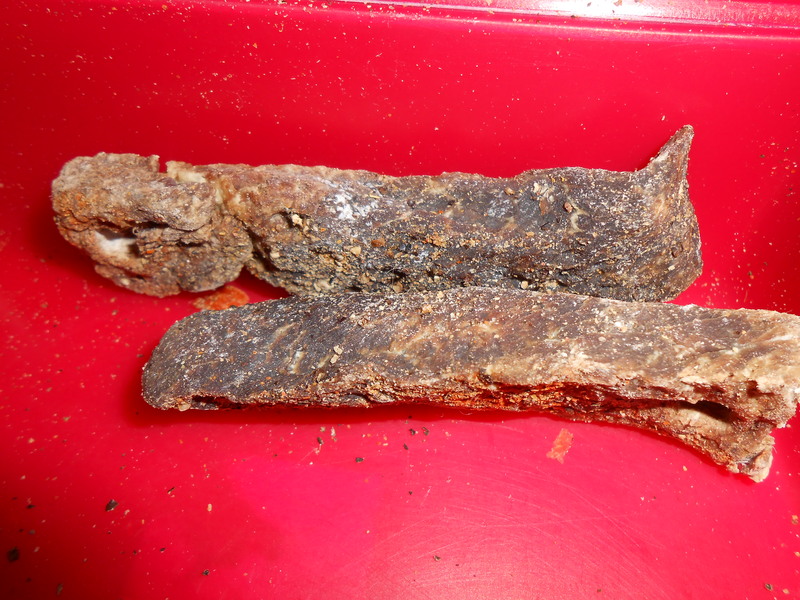 The Biltong is pretty much done now, so I will take it out and store it someplace. I am intending, within the next day or two, to try to make some Biltong with some Raw Corned Beef (which we are going to be cooking for a meal this week). I am curious whether this meat will produce a palatable Biltong as it is usually of a lower quality (with High Fat content) yet the low price makes it an attractive alternative. Finally, this is a step towards completing my 13 Skills in Preserving Meat.